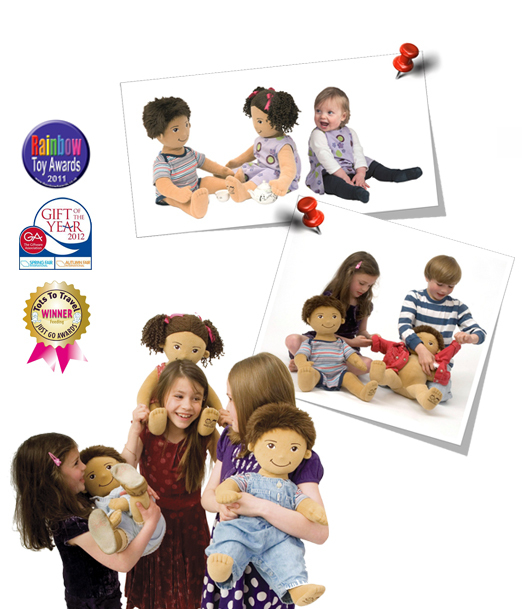 Fabulous, fantastic, fabric friends - the perfect friend for girls and boys! Oobicoo friends are designed to wear outgrown baby clothes, enourage re-cycling and re-use; dexterity, through dressing up; and communication, through role play. Each doll is the same size as a six month old baby @ 60cm tall. Oobicoo dolls are made with love and care, each one is hand sewn, so they all look slightly different - just as people do. Their filling is 100% recycled (plastic bottles which have been turned into soft, huggable stuff) and their skin is recycleable. Every Oobicoo sold is raising money for the Children’s Immunology Fund (CIF) in the UK for sick children and supporting their silbings and families. We in HK care too and will make a donation of $10 to Save the Children for every Oobicoo sold.